I know some of you don’t know this but recently I incorporated to start to my own design company that will be doing not just graphic design work, but I am currently doing custom invitation and stationary work and am hoping by January 2011 to launch my store with my first line of wedding invitations, personal stationary, and other paper items made to order as well as continue taking custom orders as well. On top of doing design work the hope is also to be taking Hitch Design into also doing hand made designs such as custom photo booth backgrounds and other hand made items in the future. I have tons of ideas obviously and have been trying to take this one step at a time and not get too far ahead of myself in the process. So being the first step other than all the paper work and talking with a lawyer I had to create a logo. I finally have decided on a logo and color palette for Hitch Design Co. and I could not be MORE excited about all of it! My goal was to keep a clean look but was not stark or cold. I wanted to create a comfortable feel to everything that was approachable and relatable since I would be working with a wide range of clients. 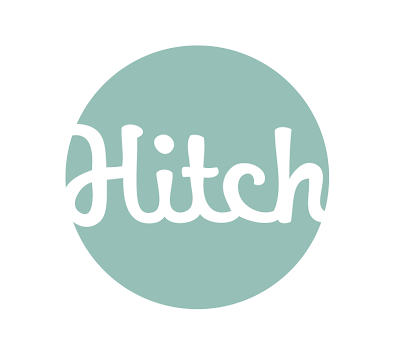 I feel the logo very much not only captures what Hitch is and will be, but also who I am as a designer. So check it out. I plan to launch a website before June 2010 so I will keep you guys updated as I get closer. I cannot wait to see how it all comes together!! OOH. I love the font. What is it?! So excited for you!